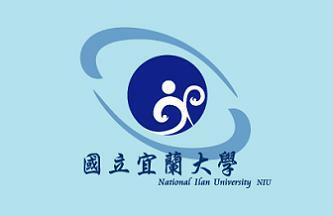 The National United University is located at the university's UnivFlag3.jpg page. And another version of the same university is at UnivFlag1.jpg. Information in English about Ming Chuan University can be found in English on Wikipedia, where the university logo as seen on university's own English language web site and flag page. The university is a family-onwed institution, which in american terms would be defined as a proprietary institution, A considerable number of such institutions in the US are little more than diploma mills, but careful reading of Ming Chuan University's web site shows that this is most definitely not the ca\se. Originally established in 1957, it was the first institution in Taiwan to provide tertiary level education in business studies for women. Now coeducational, its strengths still lie in business and management studies. Chengchi is Wades-Giles for "politics," and the university was originally a KMT partisan training school started in 1927. NCCU on the mainland closed in 1949; reopened in Taiwan in 1954, and is the first public university during the republican years to be resurrected. 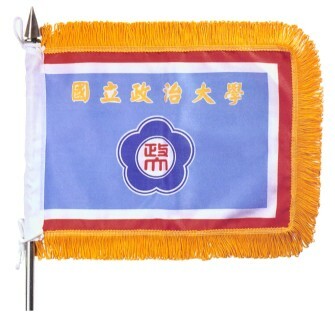 Its flag has a light blue field, border with white then red, and with a yellow fringe. 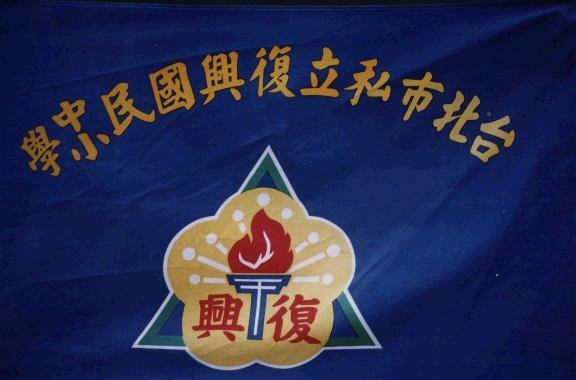 The name of the university is written in yellow on the upper half, and the emblem, a blue stylized plum blossom with the characters "Cheng Da," on a white circle in the flower. Logo on light blue bedsheet. The background is white with fine green wavy lines, and the emblem was slightly off-hoist. In the world on generic logo-on-bedsheet types this is somewhat striking. The logo itself is the symbolization of a tree. 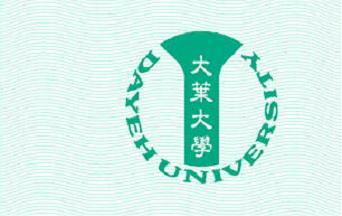 The hoist side is a monogram with the university's initials and the fly side is the Chinese name of the university in seal script. Soochow university is founded in 1900 by the meager of three schools started by The Methodist Episcopal Church South in Soochow, or nowadays Suzhou. Re-established in Taiwan in 1954, although it has been in Taiwan in 1951 as a "cram school." 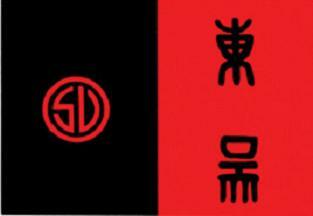 Incidentally, Soochow's campus in Suzhou, China, was occupied, aptly, by the Suzhou university, and their emblems are exceedingly similar-- the latter merely changed the Chinese "Dongwu" to "Suzhou." The University flag's color is yellow, which indicates the affinity of the University to the Holy See. The twelve stars in the middle symbolize the Virgin Mary. The lettering reads: 'Taipei City Private Fu Hsing Citizens' Middle/Primary School'. And the ideograms in the symbol simply read 'Fu Hsing', meaning Renaissance. The torch means brightness, courage and efforts. The flower means our national flower, plum flower, which means perseverance. The triangle means the junior high school, primary school and kindergarten. The circle means whole person education.